I peer through the dusty window of the information kiosk inside the entrance to the Novodevichy cemetery. A sole pamphlet in English promises to reveal the names of those who lie in one of Moscow’s most prestigious resting places. But the kiosk is locked, there is no one in sight and the guards are unhelpful. I make my way through rows of graves and monuments curious to find more about the residents. This handsome man must have been a clown in his prime. This loving couple were, no doubt, loyal citizens of the Soviet State. And are these sisters or a young mother and her child? What caused this infant death? I search for some of my cultural heroes mentioned in my guidebook. Film director, Eisenstein. Composers, Prokofiev and Shostakovitch. Writers Bulgakov, Chekhov, Mayakovsky, Gogol and, the only woman among them, Alexandra Kollontai. But I can find no trace of them amidst the brambly undergrowth. But tucked away in the far corner I find the tombstone of Nadella Alliluyeva, Stalin’s second wife. The guidebook says her tombstone is covered in unbreakable glass to stop vandalism but here she is exposed. Perhaps people have realised she was not responsible for her husband’s cruelty. That she too was a victim. She is said to have committed suicide although some believe Stalin shot her. When Stalin died in 1953 he was laid to rest alongside Lenin in the Mausoleum in Red Square but, in 1961, when Stalin fell out of favour, his body was removed and buried in the Kremlin Wall. I amble past rows of erect, military men weighed down with medals, but do not stop. Instead I am drawn to where crowds gather around a furling stone, rippled by the wind. Blue, white and red, the colours of the Russian flag. Suited men lay flowers and give homage to Boris Yeltsin, the President who dissolved the Soviet Union and who primed Putin to be his successor. I wonder where Putin will be buried. 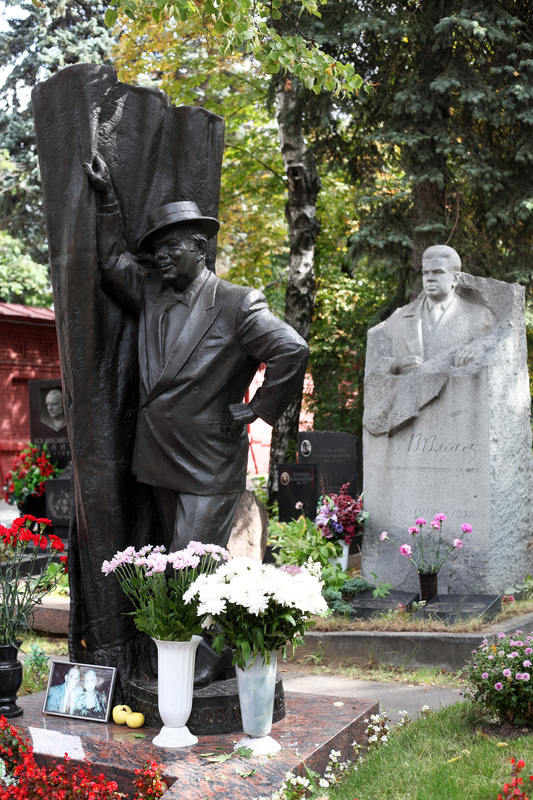 Alongside Lenin in the Mausoleum, in the Kremlin Wall, in this cemetry or in one of the 26 palaces he has access to? I progress to the far end of the cemetery where black and white blocks frame the unmistakable head of Khrushchev. The blocks were meant by the artist, Ernst Niezvestny, to portray his good and bad sides. It is surprising that Niezvestny was commissioned to design Khrushchev’s grave given that Khrushchev once dismissed Niezvestny contemporary artwork as “filth.” Like many artists Niezvestny emigrated to the United States. A group of pensioners laugh and joke around a cluster of graves that are bedecked with brightly coloured flowers. I try to fathom the inscriptions of the grave of a seated man holding a red bouquet, a faithful dog at his feet. A woman. who speaks more English than the rest, steps forward. So this is the merriment. This group of pensioners are replaying his best jokes. Nikoulin, likened by many to Buster Keaton and affectionately called Uncle Yura by Russian children, is thought to be one of the best clowns of the 20th century. Brunov was also the director of the Estrada Theatre. The helpful lady points to a rough hewn stone. Unlike her predecessor Galina Ulanova, there is no indication of Maximova’s expertise in pas de deux or the pirouette. She has turned into a rock of stone. I realize I have heard of none of these heroes and heroines of Russian popular culture, giving joy in death as they did in life. The names known to me are Eisenstein, Prokofiev, Shostakovitch, Bulgakov, Chekhov, Mayakovsky, Gogol and Kollontai whose graves I cannot find. I leave the cheerful pensioners reliving memories of youthful visits to the Estrada and the Bolshoi. I approach the information kiosk again but it is still locked up. Much of the secrets of this graveyard will remain a secret to an English woman who has not yet mastered the Cyrillic script. But then perhaps I did not need the leaflet. Far better to mix with the locals and be introduced to these Muscovites whose talents, until now, have passed me by. Posted in Chirps from Russia	Boris BrunovBoris YeltsinKhrushchev’s graveKremlin WallMaximovaMoscowNadella AlliluyevaNiezvestnyNikolin YuriNovodevichy CemeteryRussiaStalinStalin’s second wife. Next > The Jewish Museum and Tolerance Centre in Moscow – the largest Jewish museum in the world? Thanks Peter. Another Russia one coming soon.